Turn Dirt Into Dollars franchise business opportunity. Free Turn Dirt Into Dollars business franchise information. TURN DIRT INTO DOLLARS is one of the most established names in the restoration industry and was the pioneer of the Dealership concept. There are over three hundred licensees successfully operating throughout the <?xml:namespace prefix = st1 ns = "urn:schemas-microsoft-com:office:smarttags" />U.S. Let the "TURN DIRT INTO DOLLARS" Dealership help you achieve your dreams! The Equipment Package: Contains Commercial, Professional, Heavy Duty Equipment with tools and attachments for Commercial and Residential full service restoration. Equipment for smoke, fire, and flood damage is also available. Up to a five year warranty is also provided on all equipment and attachments. Truck mounted equipment is also available as the business grows and prospers. The extractors can also be adapted for full area carpet dyeing, normally, only available with extremely expensive franchises. The Marketing/Advertising Package: Includes National advertising as well as local media advertising in area newspapers, circular distribution and direct mail advertising. Licensee networking enables your business to acquire national accounts and contracts. Affiliation with professional organizations such as IICRC and ASCR will provide contacts necessary to grow your business. Penn Brush is so confident in the marketing and advertising package that you are provided with a GUARANTEED INCOME, IN WRITING - IMMEDIATELY. The Training and Support Package: Complete classroom training, taught by certified instructors, as well as On The Job training at our facilities in Philadelphia is available at no cost. Where it is inconvenient or difficult to attend training at our facilities, it can be accomplished at your location via manuals, training tapes, as well as individual phone consultation. Who are TURN DIRT INTO DOLLARS Licensees? They are single individuals, families, couples, ministers, housewives, downsized executives, retirees, and absentee entrepreneurs who manage the business. All these licensees have one thing in common. They are ambitious, motivated and possess the entrepreneurial spirit. Some operate on a part-time basis, and others, full-time. Why did over three hundred Licensees affiliate with the TURN DIRT INTO DOLLARS Dealership? 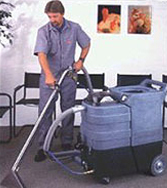 Every Licensee investigated many of the Janitorial and Maid's Franchises. They realized their continuing obligations to pay franchise, royalty, administrative and other fees. Our Licensees realized that the TURN DIRT INTO DOLLARS Dealership offers a complete TURN KEY, HOME BASED business with GUARANTEED INCOME -IMMEDIATELY. To learn more about the TURN DIRT INTO DOLLARS business opportunity, simply complete the form below.